I generally avoid super-luxurious restaurants in Italy as my experience is that simpler is better in a country where the richness of raw ingredients is among the finest in the world. 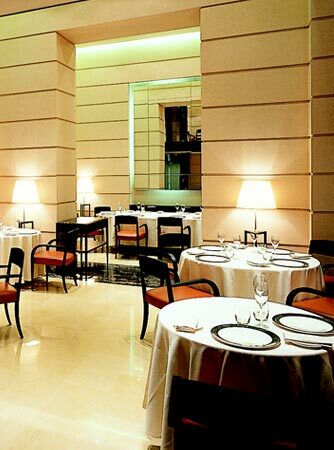 Ristorante Cracco is an exception. Properietor Claudio Cracco is one of Italy’s most inventive chefs. Cracco’s innovative, beautiful dishes combine aromas, flavors and textures in whimsical creations that show off his creative flair. Not surprisingly Cracco earned his stripes working for Gualtiero Marchesi, Alain Ducasse and Alain Senderens. While his cooking reflects those influences, there are also plenty of dishes that pay homage to the Italian classics, but in a modern, deconstructed style. The ambience at Cracco is elegant and very formal by Italian standards, yet I have always found the service to be friendly and attentive. The wine list, though extensive, is also priced in the stratosphere; even taking into account the restaurant’s luxurious setting and first-rate service. Readers seeking a unique experience may want to inquire about the small private dining room in the kitchen. While all of our courses were delicious, there were a few standouts. The Insalata Russa was a good example of Cracco’s style. This typically poor dish of carrots, potatoes, peas and mayonnaise was covered with a light layer of caramelized sugar which added unusual flavor and texture to a traditional Italian comfort food. Cracco’s Risotto al Midollo is a signature dish in which the classic Milanese saffron-flavored risotto is topped with bone marrow. This culinary tour-de-force was to die for. I am not a huge fan of offal, but Cracco’s Veal Kidnes were incredibly tender and flavorful without being overpowering. Our selection of wines was equally eccentric. A bottle of David L’Eclapart’s NV Rosé Champagne L’Alchimiste was interesting, if perhaps a touch on the sweet side. The reds were all served blind. The 2003 Cuvée Catherine from Kistler was full-bodied, expressive and simply divine in its generous expression of dark fruit. Clearly a New World Pinot, the wine showed superb balance and tons of harmony in an engaging style that made it hard to resist another taste. I was less enamored with Silvie Esmonin’s 2003 Gevrey-Chambertin Clos St. Jacques. Although the wine boasted notable concentration, it seemed like the wine’s richness had been achieved at the loss of clarity and precision. Unfortunately the wine provided little evolution over the course of the night and remained surprisingly monolithic. Parusso’s 2000 Barolo Munie enjoyed a very strong showing although I thought it was a much older wine than it turned out to be. The intense scent of geraniums was reminiscent of Giuseppe Mascarello’s Barolo Monprivato, but the wine displayed a level of density consistent with a more modern approach. A stunning bottle of the 1989 Suduiraut Crème de Tête finished off this dinner in grand style. An intense, layered wine, it burst onto the palate with masses of perfumed, sweet fruit, all while maintaining an effortless, graceful personality that paired perfectly with an ethereal mascarpone-based dessert.